Don’t let Wi-Fi be the weakest link in security. Securing user credentials via Wi-Fi shouldn’t be taken lightly. In my Wi-Fi lab I use FreeRADIUS for authenticating Wi-Fi users with 802.1X. FreeRADIUS is an open source RADIUS server used by many organizations. It performs AAA functions, supporting many authentication protocols and is widely popular because it is modular and scalable. 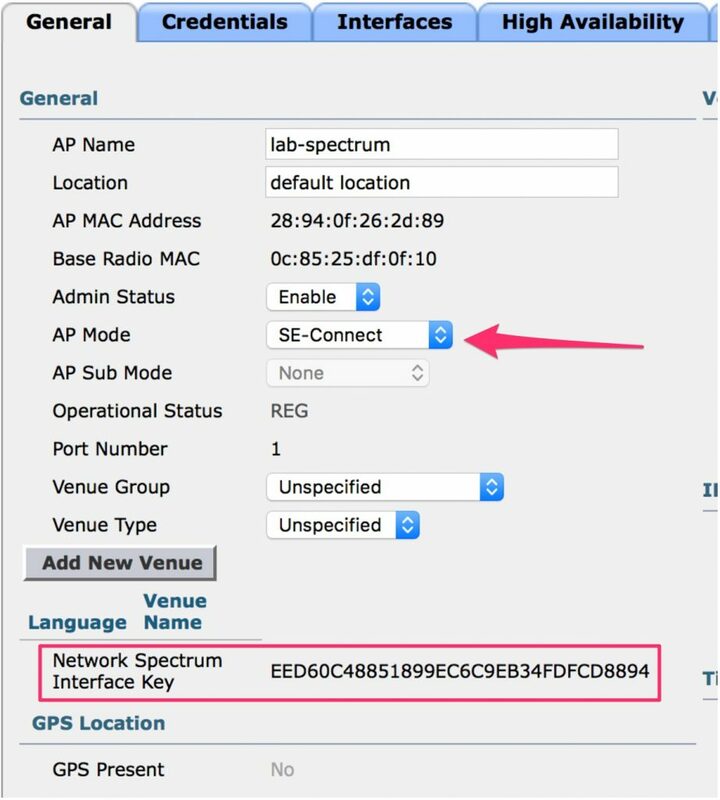 In 802.1X, and in my lab, FreeRADIUS will play the role of the authentication server. FreeRADIUS can be the proxy to another authentication server such as Active Directory. The supplicant will request to join an SSID, the authenticator will request an identity from the mobile device, the authenticator forwards the identity to the authentication server which will reply back with a success or deny. This guide will get you up and running quickly with FreeRADIUS on Ubuntu server using EAP-TTLS. My FreeRADIUS deployment was done on Ubuntu 16.04.1 LTS which I have running as a VM on my Intel NUC. Installing FreeRADIUS is the easiest part of this guide. It can be done with apt-get. Installing FreeRADIUS will also install dependencies and additional packages required for operation. Need to get 4,966 kB of archives. After this operation, 21.4 MB of additional disk space will be used. Aruba Networks brings great improvements to campus Wi-Fi in the form of management, operations, and reliability. This post was originally appeared on GestaltIT.com. Campus wireless is faced with increasing demands from BYOD, high density, capacity, and IoT. Keeping it all running efficiently is troublesome without the right solution. Aruba, a Hewlett Packard Enterprise company addresses these challenges with the introduction of ArubaOS 8. Campus wireless can now take full advantage of technologies the server infrastructure has been using for years: feature parity virtualization, flexible operation, reliability and high availability, and extensibility. Listening to customers and end users, Aruba has released a plethora of features we all have been asking for to help improve user experience through simplicity and scale. The most significant of changes compared to previous versions of ArubaOS begin with the virtualization of the WLAN controller (Virtual Mobility Controller) and taking on the concept of a Mobility Master. By allowing the campus to utilize their existing virtualization environment we now have flexible deployment options. The Mobility Master centralizes the configuration management of multiple controllers. With the growth of wireless devices lead by IoT, it is simple to scale with the demand by spinning up another virtual controller, adding more CPU, memory, and storage. The limitations of hardware appliances are eliminated. As an added benefit to virtualizing WLAN controllers, the campus can take advantage of automatic load balancing users across different controllers in Controller Clustering based on demands such as high density lecture halls and ultra high density events such as football games. Eliminating even more traditional barriers, ArubaOS 8 provides campuses to be flexible with SSID termination. Different SSIDs on the same access point can terminate to different controllers. Campuses can send their visitors to a controller sitting on their DMZ while staff and students on the same AP go to another. A welcomed feature for enhanced security through MultiZone, a multi-tenant solution for separating WLANs on the network. With wireless devices increasing at rapid rates and campuses operating on lean staff, operations become a critical turning point. As I’ve mentioned above, WLAN controllers can now be virtualized. Additionally, Aruba introduces zero touch provisioning of additional controllers. Deployment becomes easier as controllers can now dynamically find their mobility master. Network engineers can free up their time to other projects. A common challenge for network engineers is managing the risk versus reward when deploying new firmware versions on controllers. Under Aruba Mobility Master, we now have the capability of managing different versions of firmware. A network engineer can test a new version of code on one controller while the other controllers continue running the campus standard version. There’s comfort of testing new code on a small network segment without the risk of deploying new code across the whole campus. Those maintenance windows shrink as updating different features within ArubaOS 8 becomes easier. In-service upgrades allow a network engineer to upgrade functions of the wireless network without disrupting end user traffic. It’s a headache the campus faces as access points and controllers have to be rebooted when an upgrade is applied. Service modules, such as AirMatch, ARM and AppRF can be updated individually without the need to reboot the controller. A big enhancement that is well received. End users won’t be disassociated from the WLAN while updates are applied quickly to take advantage of new features and to quickly close security vulnerabilities. High on the campus list is reliability of the WLAN. Improving on the traditional controller-based model, Aruba Networks takes it a step further with Controller Clustering. A cluster can support up to 12 controllers. With the redundancy of controllers comes hitless failover and load-balancing. In the event of a controller failure or loss of connection, access points and users are automatically failed over to another controller. End users do not notice anything wrong. That means video conferencing continues without disruption, file uploads keep uploading, and TCP connections maintain their sessions. Access points will maintain more than one tunnel to a controller. One for their primary controller and another for the backup controller, up to 12 tunnels if needed. The state information is shared with the backup controller. Traditionally, network engineers were left out of a key piece of the network. Visibility into network services such as DNS, DHCP, and RADIUS, just to name a few. When services failed, the wireless network was first to blame. With Aruba Clarity, campus engineers have more insight into their WLANs through live user monitoring and synthetic testing. User data flows can be monitored to determine where issues may crop up with accessibility to other network services. 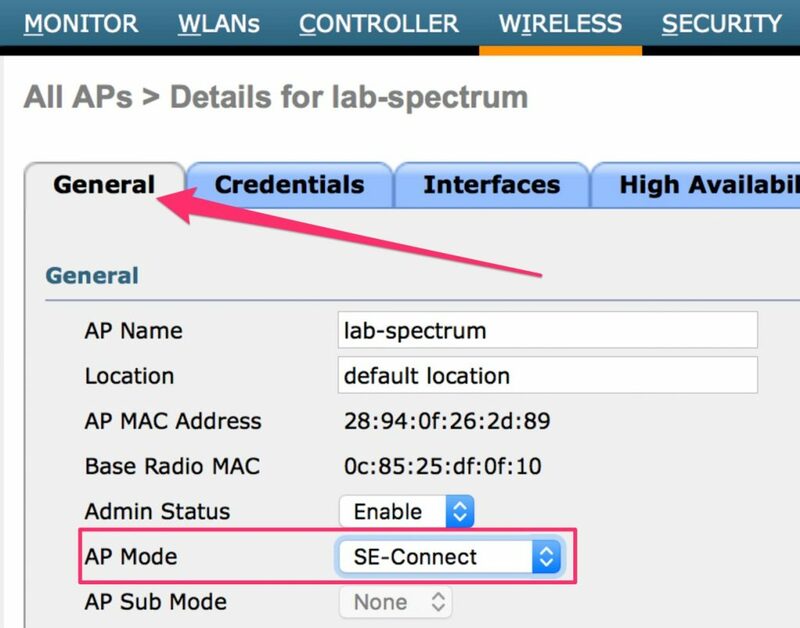 Campus engineers can perform testing before a class begins in a lecture hall by using an existing AP radio to associate to another AP to run various tests such as web page load and iPerf. This hasn’t existed before and provides a huge benefit for the WLAN and a lot of power for campus engineers. Lastly, new for campus wireless is extensibility. The traditional wireless network was limited compared to other technologies. Through ArubaOS 8, the wireless network can be improved and extended through innovation. APIs are made available for the development of applications that can tie back into the WLAN. With deep visibility into the WLAN we are able to get data on RF health, app utilization, device types, and end user data. What does this mean for the campus? Security can be further extended through in-house application development or partnership with other companies to enhance security. These APIs can take the end user experience even further than we have imagined. Finally, the WLAN can become a cornerstone for the campus. We can look forward to extending wireless beyond just simple connectivity through the use of APIs. We have broken the barriers of pizza box appliances and gained flexibility through virtualization with nearly full parity. Management is vastly improved with ease of deployment and the introduction of a mobility master. ArubaOS 8 is a full featured wireless solution which provides the campus the reliability it needs as wireless becomes the primary point of connectivity moving forward. 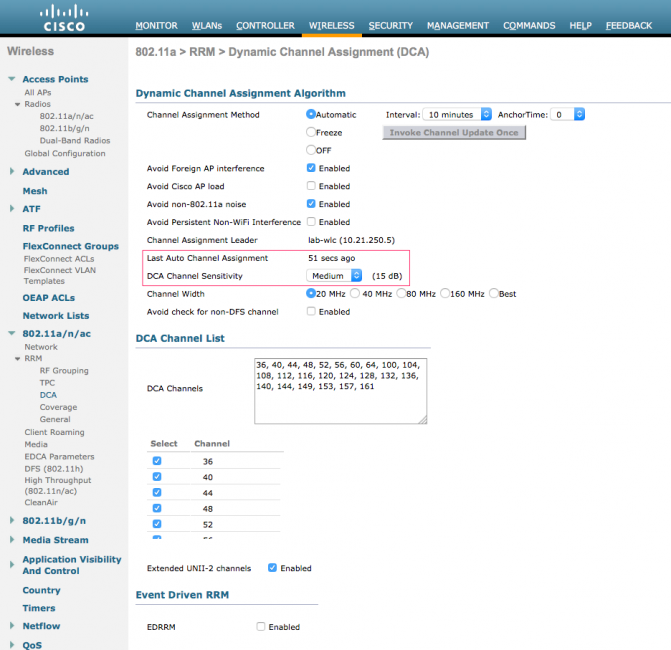 Configuring Cisco RRM DCA is part of a series of posts on Cisco RRM. In this post I will go over the configuration options of DCA. 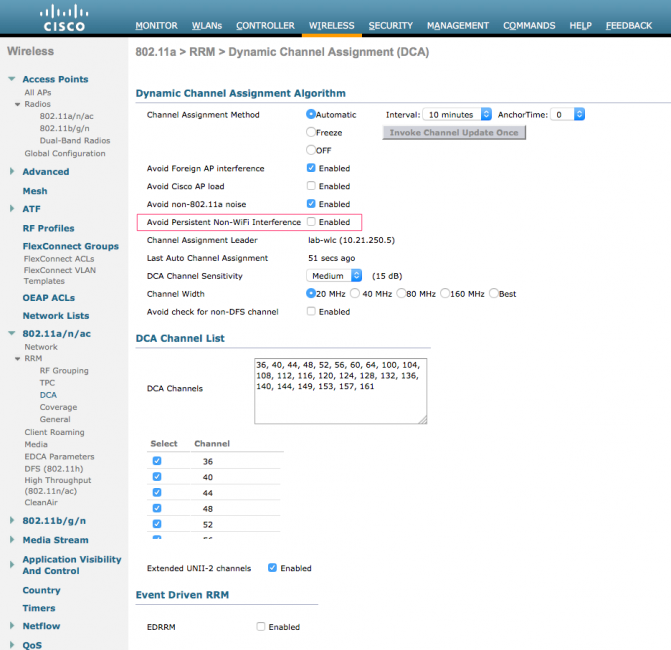 DCA, or Dynamic Channel Assignment, is a core component of Cisco Radio Resource Management (RRM). It runs a critical algorithm which dynamically changes an access points (AP) client serving channel based on multiple parameters, collectively called a Cost Metric. The first thing you will notice is the Channel Assignment Method of Automatic, Freeze, or Off. Automatic will run the DCA algorithm at the define Interval which is every 10 minutes by default. The anchor point is used to set the time of day the DCA algorithm would start. For less frequent channel changes, increase the interval. Keep in mind that clients will be disconnected briefly for a channel change. Freeze does not run the DCA algorithm unless triggered. Off disables the use of RRM and its auto-rf capabilities. 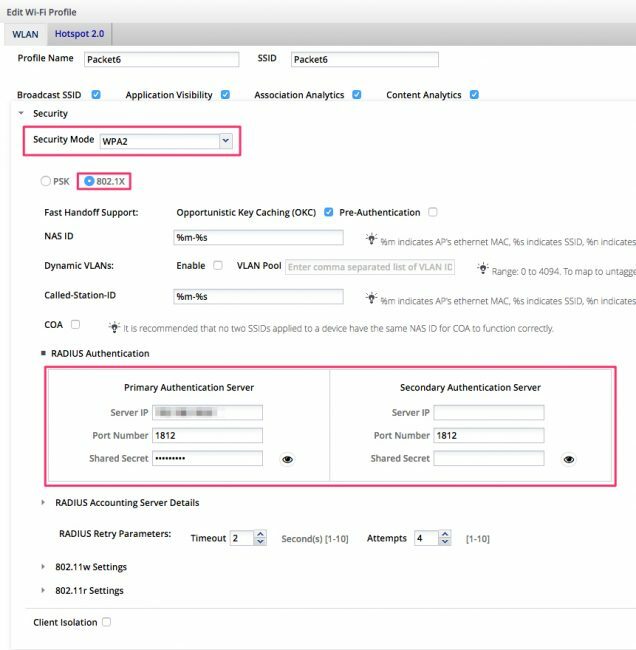 Enabling this option allows RRM to take surrounding neighboring APs that are not part of your network into consideration. RRM will create a channel plan to help mitigate co-channel interference. This option allows RRM to consider the traffic load on an access point to help build a better channel plan. I don’t believe in enabling this feature because it can be difficult to make a client device associate with a specific AP. This RRM option takes interference on the channel into consideration for the channel plan. The category of interference is anything coming from a non-AP. Sometimes there is non-Wi-Fi device interference affecting your wireless network. DCA can help mitigate the issue if Avoid Persistent Non-WiFi Interference option is enabled. RRM will receive information from CleanAir and if the interference is creating a negative impact, RRM can issue a channel change to avoid it. 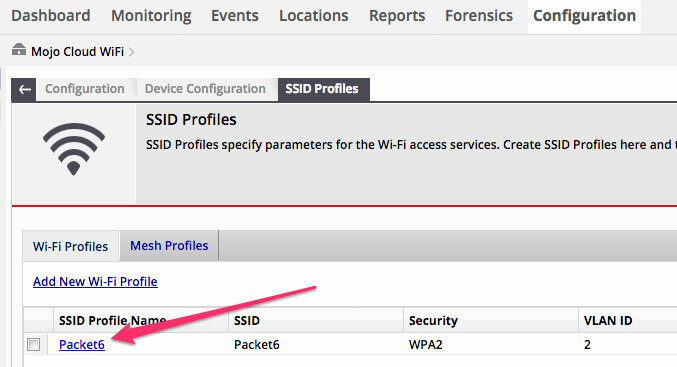 Viewing persistent devices can be done by viewing the details of an AP from the web interface. At the bottom of the page are all the persistent devices being tracked including the class type, on what channel the interference was hurt, what the duty cycle is, RSSI, and when it was last seen. Scheduled – DCA algorithm runs at a selected time. Usually to minimize changes to off peak hours. Steady State – DCA algorithm running at a specified interval. Startup Mode – Used when making changes to the wireless network architecture. It restarts the DCA algorithm and runs for 100 minutes at high sensitivity. By default, DCA has a medium channel sensitivity at 15 dB for 5 GHz and 10 dB for 2.4 GHz. This is the DCA Sensitivity Threshold. By changing the channel sensitivity to high, then a cost metric of 5 dB better will recommend a channel change. To have DCA dynamically select a channel, it must be in the Channel List. You can select specific channels for DCA to select from or select them all, including the UNII-2 channels. 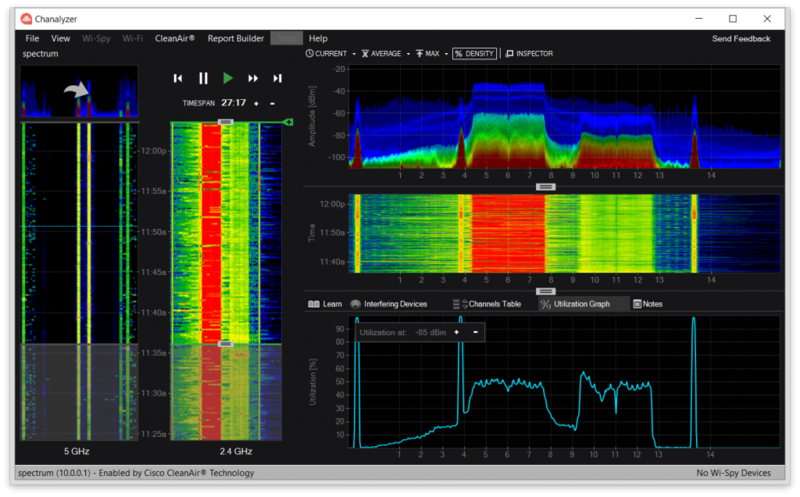 RRM has a flexible way to assign bandwidth to APs by analyzing the RF and selecting the best channel width. By default, DCA uses 20 MHz channels. 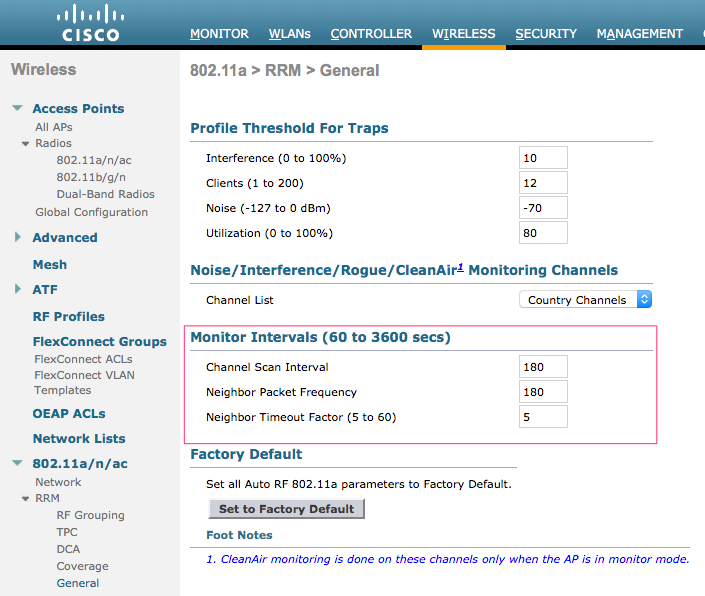 You can configure Cisco RRM DCA all the way up to 160 MHz channels or select Best to have RRM pick for you. If an AP doesn’t support 40/80/160 MHz channels it will not be configured for it. In the output above, Cisco RRM DCA made a request to change an AP to a 40 MHz channel width using primary channel 100 and secondary 104. At the very end, RRM sets the channel to 100 with the reason – to reduce co-channel interference. The output was truncated just to display the channel assignment information. You can see the current and previous channel average energy, how many times the channel has changed, when it was last changed, and which is the best recommended channel. If you need the wireless network to react quickly and automatically to bad interference, ED-RRM is an option to enable. An example could be a device using 100% duty cycle causing all nearby APs and clients to hold off communicating on the wireless medium. ED-RRM would allow an AP to make the channel change sooner than when the DCA interval kicks in. The Rogue Duty-Cycle option will allow you to set the percentage of duty cycle and rogue duty cycle occurs before triggering EDRRM. To learn more details about Cisco’s RRM – DCA be sure to check out the white paper from Cisco. 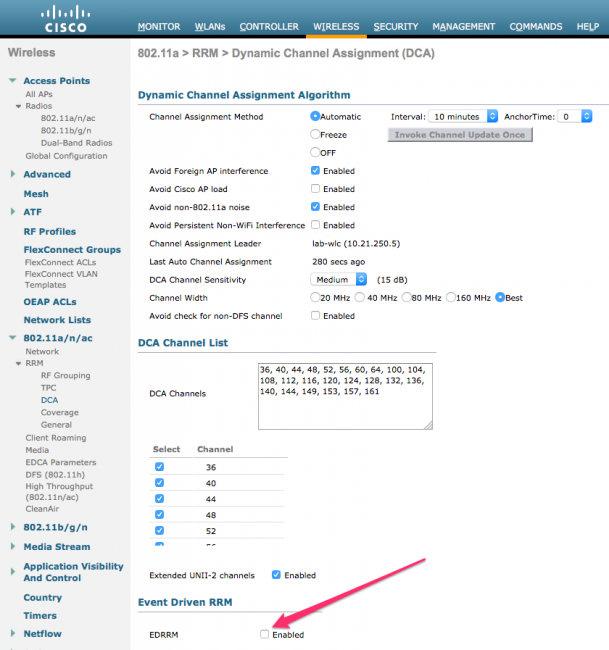 Cisco NDP – Neighbor Discovery Protocol – What Is It? Do you have something to add? Let us know in the comments below.